When you have a child that is under 18 years old, you will have to present their immunization chart multiple times as they go through school and other public enrollment spots. 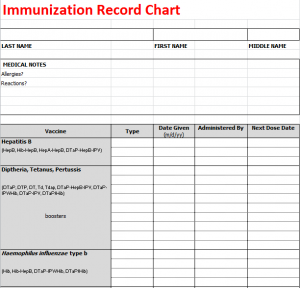 The Immunization Record Chart is a simple one page Excel document that allows you to easily track immunizations, their dates, and their administers. Download the template using the link below and open it in Excel. The chart already has common vaccines listed along with what each vaccine includes. The only vaccine that would change is the Influenza vaccine as it varies each year. The chart mimics the standard sheet given out at public schools to fill in immunization information. Simply enter the person’s information at the top, and be sure to note any medical reactions, immunization related or not (such as a latex allergy). From here, fill in the vaccines that the person has received. If it has been a long time, you can get the date of immunization from your doctor or put down your best guess as most basic vaccines are given to children on the same day. Keep digital and solid copies of the chart at all times. Likely schools and other public settings will want a copy on hand. If you’re unsure about dates of immunization or if you ever received it, contact your pediatrician as they will have kept the files on this. Some vaccines may be left empty, such as the HPV vaccine because of its age restrictions and it is not required. Likewise, the influenza and shingles vaccines are optional and some choose to forego it or had bad reactions and did not get it again.